Which of us ever thought we might see a photograph of a car from pre-1956 Thailand, when the international oval was ‘SM’? Well, Europlate member no. 83, John Pemberton, started noting strange plates when he went up to Oxford University in 1937 and though his thousands of records of the intervening years are in written logs, he did take some black-and-white photos from time to time, many of which are now important historical records of plates never to be seen again. John, who is in his nineties, and still spotting whenever he goes out in a car, has passed his album to the RPWO Blog for scanning, so that we can all share his gift to the recorded history of our odd pursuit. (y) 1940s plates were 390×110 mm (or 270×90 mm for motorcycles) and the registration consisted of two small Thai letters vertically aligned being a code for the province (see Table 1, column 2), followed in Bangkok and Chon Buri by a Thai letter and four numerals, or in other provinces, by five numerals. The 2 Thai letters abbreviate Krung Thep, the short-form Thai ceremonial name for Bangkok – and meaning City of Angels according to King Rama III. 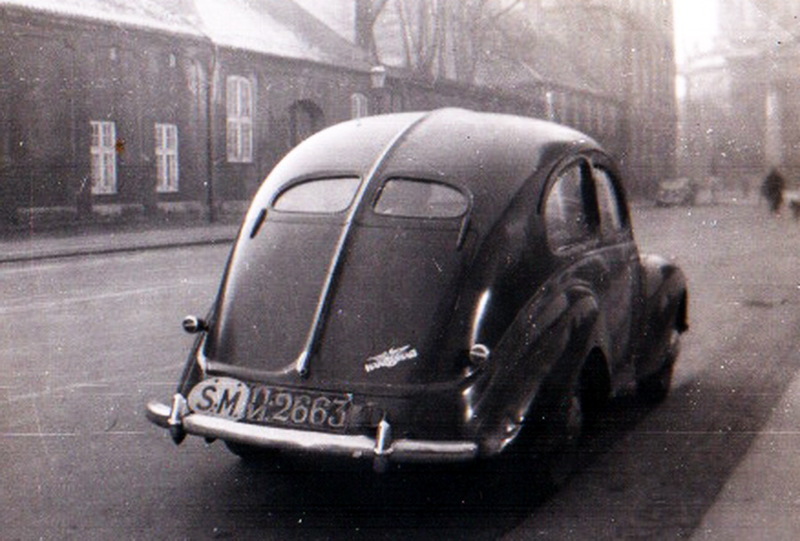 Siamese-registered Hanomag 1300 ‘Autobahn’ model, made between 1938 and 1941, seen in 1947 Denmark by member Pemberton. Note that unique oval! 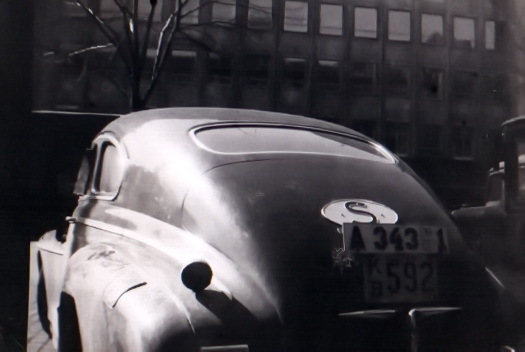 The same day, John saw a 1947 New Jersey plate off Radthusplads, also bearing Stockholm reg. A 34351. It seems that it was then common for foreign tourists to carry both their home plate and a visitor plate during their tour in Europe, as several of John’s shots depict such doubled plates. Addendum It transpires that countries which were not signatories to the International Traffic Convention, could not circulate freely on the roads of the member countries while using their own plates. Among others, the USA and Canada were late to join and until about 1955, had to obtain some temporary plates of the country they were visiting, as they entered at a port or other frontier. Britain had its ‘Q’ series, France its TT. Sweden and Switzerland gave them normal plates. Full details of the Conventions are being assembled currently, by our former president, Bernt Larsson. More of John’s sightings will be coming to the Blog shortly. This entry was posted on Tuesday, January 8th, 2013 at 1:03 pm and is filed under Asia, Historic, Siam, Thailand. You can follow any responses to this entry through the RSS 2.0 feed. You can leave a response, or trackback from your own site. What a record of shots John! The topic of the addition of “visitor plates” on a vehicle when travelling abroad must be considered under the angle of the international conventions on road traffic. Concerning the USA, they had never been any parties of such conventions before August 1950 when they ratified the 1949 Convention. 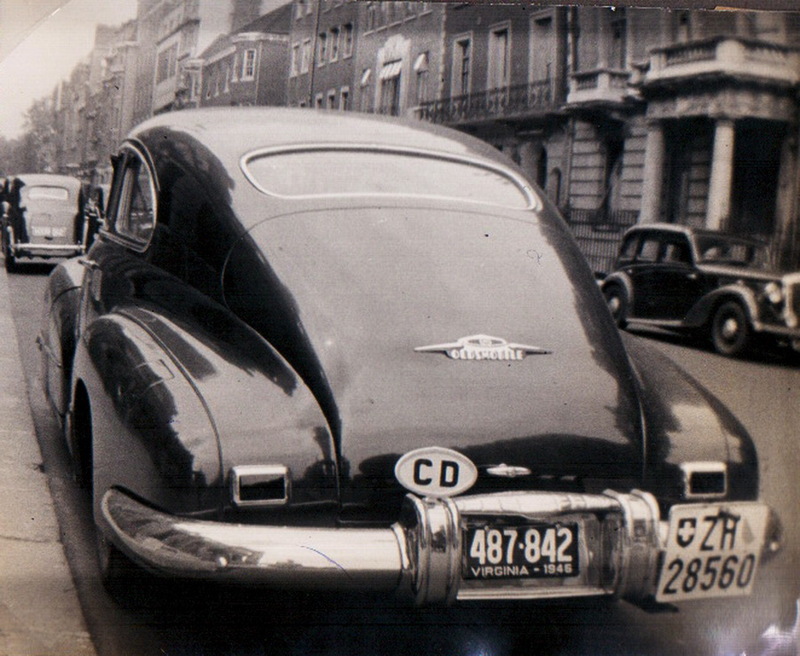 So, before that time, US cars driven abroad were obliged to show specific plates, in general temporary plates – red – plates if already deployed in the receiving country. So, the two pictures dated 1946 and 1947 are nice and very interesting, but can be explained that way specifically. A vehicle coming from a country party of the convention driven in a country that was a party too could be run under its original plates, for instance a French one driven in UK. What I explain above is related to the multi-lateral scheme implemented by the international Treaties. That did not prevent the setting of bilateral agreements. For instance US cars were allowed in 1937 or 1938 to run in France with their US plates – France had been accepting US vehicles since 1919 even if the USA were not a party of the 1909 Convention (and 1926 later). P.S. Siam with SM has been a party of the 1926 Treaty since 1929! Most interesting, Thierry. It explains why several of the pre-1950 photos of foreigners in Europe, carry a second plate, that of the host country. We have a picture of a Tangiers Freeport car, bearing British QC Foreign Visitor Plates, which must fall in to the same category as your describe. I will put up a post for that. Is there an article anywhere on the history of the treaties to which Thierry refers? A first insight can be provided by the texts of the treaties themselves, concerning purposes, agreement of vehicles with a view to international traffic acceptance, means for participating in the treaty, ovals, … For the 1909 and 1926 conventions, I have not seen on the Internet any translations in English (text is in French), Nevertheless, as the different countries have generally ratified the treaties at the level of their Parliaments, I believe that the translations in national languages, for 1909 and 1926, can be found in every national journal/official collection of legal texts. The 1949 convention is easily available on line in the two languages of the conference (English and French). This is a good start for understanding. On the other hand, when bilateral treaties have been implemented – and they have a real impact on plates and ovals, as shown – the review of national texts, country by country, is mandatory for exhibiting them, and this is not easy!